The Milwaukee 2997-22 two tool cordless combo kit delivers the most advanced 18-Volt cordless drilling and fastening technology in the industry. M18 FUEL is fully compatible with the Milwaukee M18 18-volt cordless system, featuring over 150+ tools. Included is the M18 FUEL 1/2 inch Hammer Drill (2804-20) that delivers Up to 60% More Power, is Up To 1.5 inch Shorter and is Up To 2X Faster Under Heavy Load. At 1,200 in-lbs of torque and 6.9 inch in length it has the power for demanding applications. Also includes is the M18 FUEL 1/4 inch Hex Impact Driver (2853-20) which is the Fastest, Most Compact, and Most Powerful tool in its class. At 2,000 in-lbs of torque and 4.59 inch it increases user productivity for demanding fasteners and gives users more access to tight spaces. M18 FUEL features the most advanced cordless technology in the industry, a POWERSTATE Brushless Motor, REDLINK PLUS Intelligence and REDLITHIUM Battery Technology, resulting in longer motor life, longer run time and more power. 2804-20 Hammer Drill: POWERSTATE brushless motor delivers up to 60% more power, is the most compact in its class at 6.9 inch in length, and provides up to 2X faster speed under heavy load. The DEWALT DCD796D2 20V MAX* Hammer Drill is designed with a brushless motor that delivers up to 57% more runtime over models featuring brushed motors. This hammer drill also features a high speed transmission with two speed settings (0-550/0-2,000 RPM) improving both speed and torque control across a range of fastening and drilling applications. The DEWALT DCK299D1T1 20V MAX* XR Lithium Ion Brushless Premium Hammer Drill & Impact Driver Combo Kit is is a combination of the 20V MAX* DCD996 1/2-in Hammer Drill and DCF887 1/4-in impact driver. The DCF887 1/4-in impact driver provides 1,825 in-lbs of max torque at fast 0-3,250 RPM speed and 0-3,600 impacts per minute. The DCD996 1/2-in Hammer Drill 3-speed, high performance (0-2,000 rpm), all-metal transmission optimizes tool-to-task for fast application speeds and improved run-time. The 2497-22 M12 Cordless 2-Tool Combo Kit includes the M12 3/8-Inch Hammer Drill/Driver and the M12 1/4-Inch Hex Impact Driver (2450-20). The innovative M12 cordless system is designed to deliver the power and torque required for professional applications, in a size that reaches the tightest and toughest places. Powered by REDLITHIUM, the M12 cordless system offers unmatched power, speed and tool belt portability. Each tool in the Milwaukee 2497-22 kit has a built-in power gauge that indicates the remaining charge in its Lithium-Ion battery, which charges in as little as 30 minutes on the included charger. These tools also come with a carrying case for added convenience. Cordless tools powered by REDLITHIUM batteries deliver more torque, more power and longer run time than the competition. 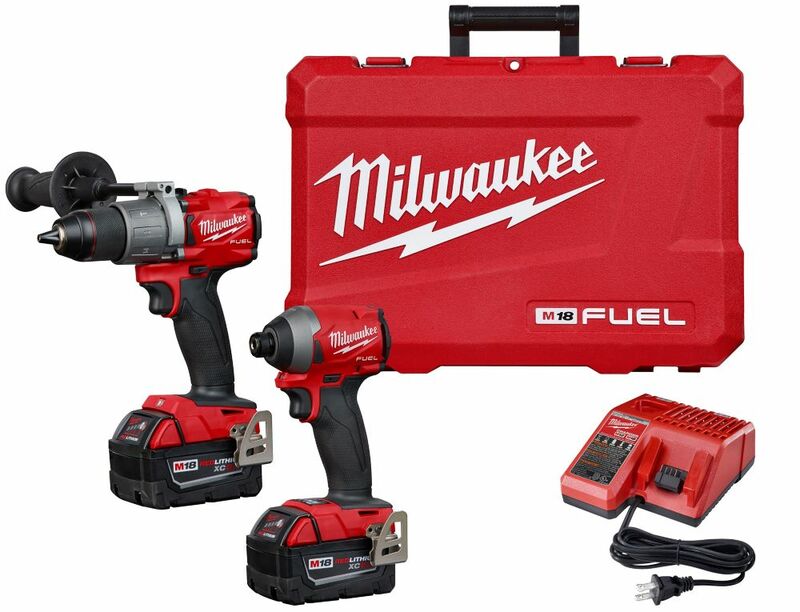 M18 FUEL 18V Lithium-Ion Brushless Cordless Hammer Drill & Impact Driver Kit with (2) 5Ah Batteries The Milwaukee 2997-22 two tool cordless combo kit delivers the most advanced 18-Volt cordless drilling and fastening technology in the industry. M18 FUEL is fully compatible with the Milwaukee M18 18-volt cordless system, featuring over 150+ tools. Included is the M18 FUEL 1/2 inch Hammer Drill (2804-20) that delivers Up to 60% More Power, is Up To 1.5 inch Shorter and is Up To 2X Faster Under Heavy Load. At 1,200 in-lbs of torque and 6.9 inch in length it has the power for demanding applications. Also includes is the M18 FUEL 1/4 inch Hex Impact Driver (2853-20) which is the Fastest, Most Compact, and Most Powerful tool in its class. At 2,000 in-lbs of torque and 4.59 inch it increases user productivity for demanding fasteners and gives users more access to tight spaces. M18 FUEL features the most advanced cordless technology in the industry, a POWERSTATE Brushless Motor, REDLINK PLUS Intelligence and REDLITHIUM Battery Technology, resulting in longer motor life, longer run time and more power. M18 FUEL 18V Lithium-Ion Brushless Cordless Hammer Drill & Impact Driver Kit with (2) 5Ah Batteries is rated 4.6 out of 5 by 176. Rated 5 out of 5 by Moose from Very powerful, like the feature settings on impact driver.... Very powerful, like the feature settings on impact driver. Rated 5 out of 5 by FairlyTrueGrit from These have been an amazing upgrade to my 20 year old power drills. I'm back to drilling through w... These have been an amazing upgrade to my 20 year old power drills. I'm back to drilling through wood! The light helps more than I thought it would for getting into darker areas. The tools themselves are lightweight, but these 5Ah batteries are giant and heavy compared to my compact 18V Fuel one. I also haven't had the big batteries die me either, so that's nice. Love the belt clip on there for when I need my hand in the middle of something - very handy. There are a lot of new features on these, like different settings for different projects and a little add on piece, so reading the manual for a breakdown of those was really helpful. Overall, very pleased and have already put these to good use building a pair of french doors and installing some cabinets in my garage. Rated 5 out of 5 by Marty from Best Drill setup I've ever purchased!... Best Drill setup I've ever purchased! Rated 5 out of 5 by HomeDepotCustomer from They are very dependable , love the hard carrying case... They are very dependable , love the hard carrying case , wish Milwaukee would sponsor my company !!! !